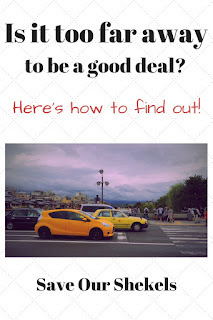 We Israelis are experts in finding the best deals on just about everything. We've got our apps and newspaper flyers, and we are determined never to end up freiers (hey, I'm a poet and I didn't know it!). But what if that great deal is located far away - for example, in a town other than the one in which we live? Is it really still such a great deal in that case? How will we know if the trip is worth it? If you're going to get there by public transport, the calculation is easy: just check if your expected savings are equal or greater than what you'd be spending on bus or train fare, and don't forget to also include the price of home delivery of heavy items, if you won't be bringing them home yourself. If your output on transportation exceeds your expected savings on the items you'll be buying, save yourself the trip and buy locally. Obviously, if we're talking about unique items which are hard to find elsewhere (can we mention just about every trip of mine to the closest IKEA? ), this is less of a factor, but it's still useful to know just how much extra the trip itself is costing you, on top of the price of the items you're buying. * The distance from your house to the store. Please bear with me - the explanation is a bit wordy, but once you know how to find the information and calculate the price of your trip, it will become almost second nature and take you less than a minute to do. The "old-fashioned" way to measure this is to keep track of how many liters you fill at the pump (it should be on the receipt), and then check your odometer. When you fill up again, you should have a rough measure of how many km your car has driven on that tank of gas. 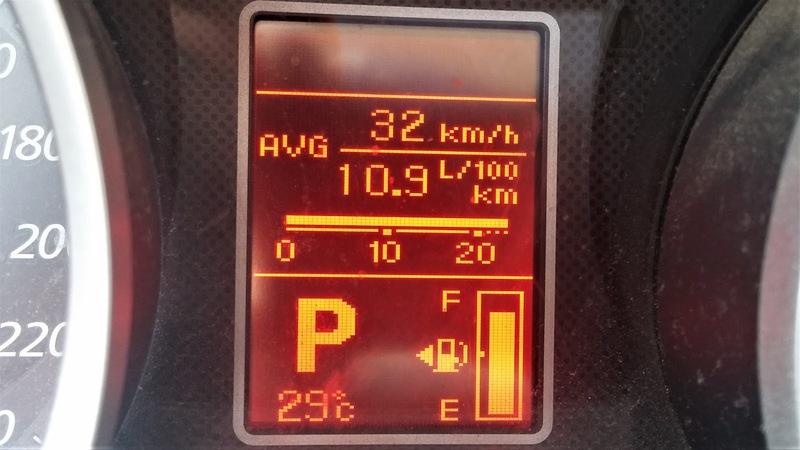 Many newer cars will do this for you, in a way: the car in the photo has a feature which measures, on average, how many liters of gas your car expended driving 100km. To convert this into km per liter, you simply reverse the fraction. In the case of the numbers in the photo, 100/10.9=9.17 km/liter (which is crappy mileage, mind you. Here are some useful tips to improve this). The cost of a liter of gas is also not hard to find: it, too, will be on your last gas station receipt. If you're not into keeping those, you can find out the price with your handy-dandy Fulltank app. So what do we do with all this information? Let's say we found a deal on out favorite widget at the Great Deals store - NIS 50 instead of NIS 80 at a store nearby. Hey, a nearly 40% discount is nothing to sneeze at! However, The store is 45 kilometers away from our house, our average gas mileage is 15km/liter, and the price we pay per liter of gas these days is NIS 6. We can easily calculate that we will be spending 6 liters of gas getting to the cheaper store and back (45*2/15). Since each liter costs NIS 6, the cost of the trip will be NIS 36. Hmmm....spending NIS 36 to benefit from a NIS 30 discount? I think I'll pass, unless I happen to have another excuse reason to be in the area of Great Deals store. I hope this post is of help to you in making better informed judgement about what is, and in particular, what isn't, a deal worth travelling for. 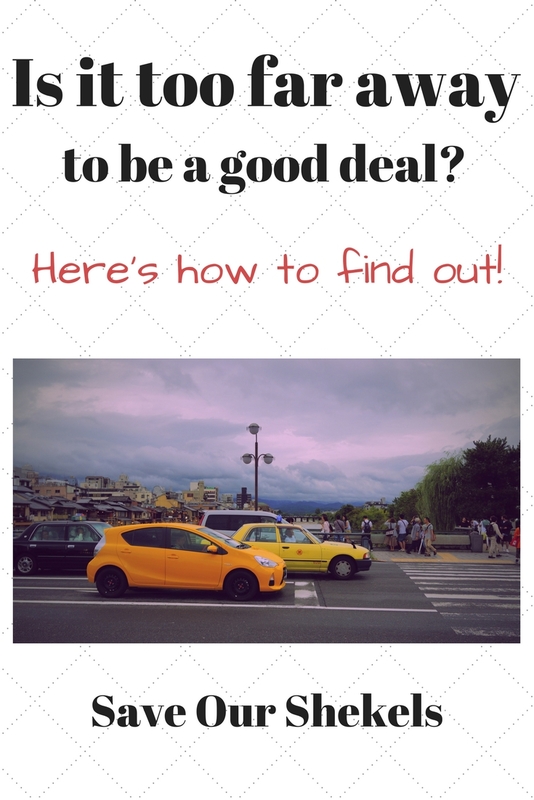 Have you ever run into a great deal you had to pass up because it was too far away?